Videos of us on location delivered to you via YouTube. "I would now like to spend a few minutes talking about roadside sobriety check points – what are they, how do they work, and what results can they achieve? Roadside sobriety checkpoints are temporary or mobile installations set up by the local police department, usually late at night or during the early hours of the morning – when the majority of road traffic fatalities are recorded. The police decide ahead of time that every nth vehicle will be stopped. In other words, the police decide ahead of time that they will stop every 10th vehicle, or every 20th vehicle. Once that decision has been made, the checkpoint begins. The driver of each vehicle stopped is roadside breath tested. If however the roadside breath test shows at or above a certain level of alcohol, the person is transported to the Police Station or to the Police Command Vehicle for the fully calibrated alcohol breathalyzer machine test. This process is called “non-selective testing”. Non-selective, because it is non-discriminatory, there is no room for profiling in any way. It is an entirely impartial, unbiased, process." Thursday April 5th: CADA’s Annual Tag Day, see some photos of our wonderful Tag Day Volunteers!! Friday April 6th: CADA partnering with CARIFTA. CARIFTA has kindly agreed to display CADA banners and CADA TV ads during these games, thank you CARIFTA team!! Wednesday April 11th: CADA’s Open House see photos from April 11th Open House from 3:00pm until 6:00pm, please stop by and learn more about what we do, the goals we are working towards, and the legislative changes we are lobbying for. We are located on the 3rd floor, Suite 307 of the Melbourne Building on the corner of Victoria Street and Parliament Street, just down from the Hamilton Pharmacy, it is the light blue building with the dark blue shutters, and we look forward to meeting you and to seeing you then. CADA is very pleased to announce these winners of our Youth Video Competition. 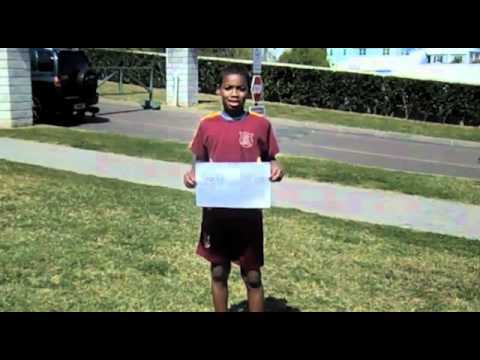 CADA created a video competition aimed at young people for young people. We believe teens and pre-teens will embrace messages from their peers about the importance of abstaining from alcohol use. We would like to thank all those who entered this competition. The topic of the video was, "What children and teens can do to prevent alcohol use amongst their friends and why this is important"
8-session program completed at Berkeley Institute with a group of 20 beautiful students. The average age for drinking alcohol regularly - 14 years old - Bermuda student survey. 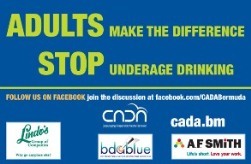 CADA, during a joint press conference on July 14, 2011, launched its summer alcohol awareness campaign. CADA Chairnan Mr. Anthony Santucci said, “I am pleased to be here to talk about the summer alcohol awareness campaign which we are launching today. The print campaign is aimed at adults and is called “For Adults Only”. With the support of our Sponsors, Bermuda Blue Printing, Lindo’s Group of Companies, AF Smith and the Bermuda Post Office, 28,000 of these information cards FOR ADULTS ONLY! Summer Flyer will be delivered to every household in Bermuda. The information detailed here explains why it is important to keep alcohol out of the hands of children and young people. CADA would like to highlight the legislative initiatives successfully lobbied to date and to detail further legislative initiatives we would like to see adopted in Bermuda. Let’s look at the successes first. In 2007, CADA was tasked by the Department for National Drug Control to form a Legislation Committee to review the Liquor License Act 1974 and provide a report of recommendations to update the Act. CADA invited a number of organizations to be represented on the committee. They included: insurance companies, the faith community, Bermuda Chamber of Commerce, various entertainment organizations, the hospitality industry and The Road Safety Council. •	Making TIPS certification for all managers, supervisors and persons in charge of bars at on-premise licensed premises mandatory as of the date of June 1, 2011. TIPS is a one day certification program on the responsible selling and serving of alcohol in licensed establishments. •	Giving the Bermuda Police Service the power to close down licensed premises for up to 24 hours in the event of serious disorder or a threat to public safety. •	Making it a requirement that after gaining membership in a members club, a new member must wait 48 hours before he/she can legally use the clubs facilities. CADA in conjunction with goverment Ministers, key stakeholders, schools and members of the public successfully launched April 2011 as Alcohol Awareness Month. Freddy stole the show as the goalkeeper during the 'Bend It Like David' event at the Island Soccer League, earlier this year.